When you encourage people to use systems thinking, you’re asking them to explore and identify the underlying forces at work rather than focus on the superficial symptoms. 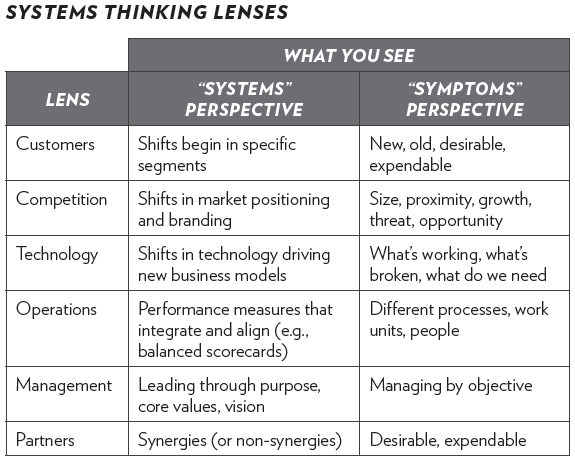 The table below shows some examples of systems thinking “lenses” through which you can view your organization and its environment. Most people become accustomed to focusing their attention in just a few places—on the competition, for example, or on technology. When you use systems thinking, you take a more holistic view. Using a systems perspective you also discover there are fewer variables to juggle. As you step back and view things from a longer time scale, you find it easier to pick out the critical issues to deal with. The result is a more balanced perspective, clearer thinking, and stronger leadership. Systems thinking can be applied in almost any context. Systems thinking means having the ability to view things in different time scales simultaneously and thus resolving the paradoxes between them. For example, our firm was asked to facilitate the transformation of a blighted urban neighborhood in Oakland. We invited a number of “experts” to offer their views to a panel of residents. A city planner looking at the neighborhood told them that crime could be reduced by building new housing units. A group of residents argued strenuously that the key to saving the neighborhood was reducing drug dealing in the park. A cop testified that reducing crime would require a yearlong undercover surveillance effort. When we introduced systems thinking, everyone agreed that the ability to transform the neighborhood depended on attracting new residents. They also agreed that the best way to do that was for the neighborhood to develop a deeper sense of its own identity and ownership. From these insights, a new neighborhood association was born, with 80 percent of residents taking part in regular meetings. A revitalized neighborhood watch group sprung up. Within a year, developers started constructing new housing units. Crime went down. People began returning to the neighborhood, buying properties. Neighbors celebrated their success with a huge street fair. The mayor hailed it as a model of downtown renewal. Using systems thinking, you can assess your blind spots and figure out your mental models. Your blind spots and mental models are the underlying habits that inform—and in many ways limit—your thinking. What assumptions do you typically make that prevent you from making solid decisions? If you look at yourself objectively, what could you improve? Think about the natural “cracks” within your organization. Where’s the greatest tension? To what extent have you fallen victim to your own mental models? Are you making the appropriate investment in each area of your relationships? 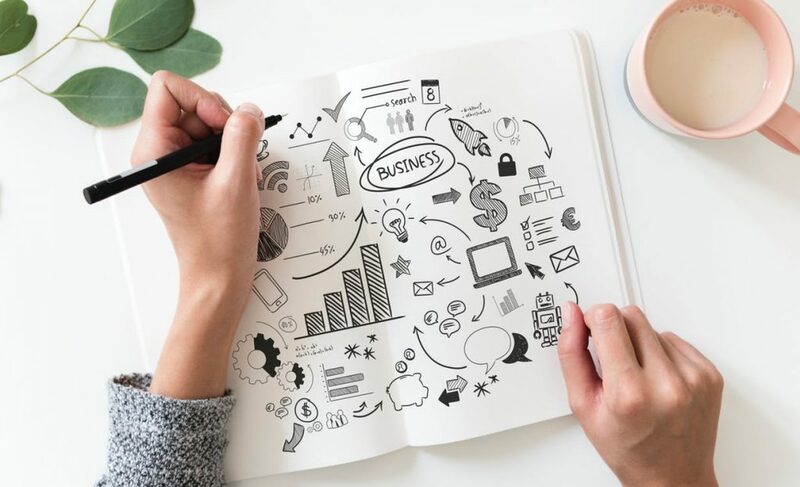 Are you communicating enough with your customers? Are you balancing the quest for new business with the retention of existing business? Do you meet regularly with your direct reports? Are you sufficiently focused on the financial data that can inform your decision making? Do you deflect too much blame onto others and not assume sufficient responsibility yourself? Reflecting on questions like these will help you become a better systems thinker.